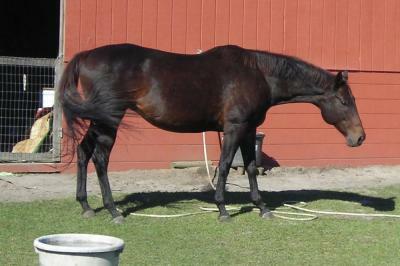 A horse "on the bit" is a horse who has shifted much of his weight to the hind legs. As a result, he is working harder in his haunches and through his back. His hind legs will have more movement to them; they will be flexing more and moving further forward under the body. His back rounds a bit as he uses it properly, and you can really feel those hind legs; it's a beautiful feeling but hard to describe. Sort of elastic. As a result of all of the above, the horse's neck will curve in harmony with his back; typically his poll will be the highest point and his face will come back to vertical. This is as a result of, not a way to achieve, coming onto the bit. Specific aids to bring a horse onto the bit will indeed vary from horse to horse, depending on training, body type, etc. But the basics are the same: you ask the horse for more energy, without letting him expend that energy by moving faster. Use your legs, ask for energy, "listen" with your body for more movement, use soft aids of seat and hand to keep the horse from simply speeding up. 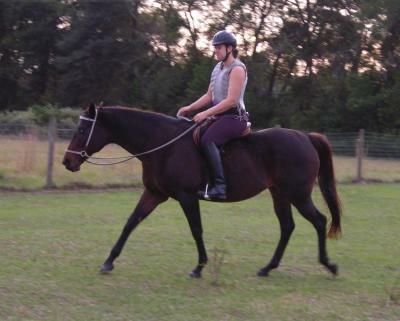 Any horse--who's rideable--should be able to do a little work on the bit. If it's not the horse's normal way of going, however, it will take much more effort than he is used to giving. 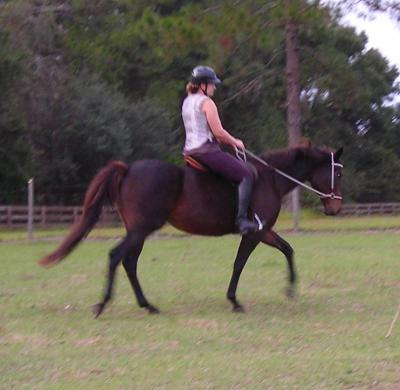 Most of the time, a horse will "pull" himself along by his front end, carrying most of his weight on his front legs. Unless he has been taught to use his hind end and his back, then going on the bit will be very difficult, at least at first. So at first, he should be permitted to work for only short periods and then to stretch his neck out; if he is held in position but doesn't have the muscle to support it, he will cramp up and begin to resist; this will undo all the good of the work "on the bit" already done. Forcing a horse's head into position without actually engaging the hind end causes a horse to hollow his back, and makes it near impossible to work through his back and hindquarters. It's important to be sure that the energy from behind comes *first*, and then the mild aids to ask him to use all that energy without just going faster. Got some interesting pics today, wanted to share them and some evaluation. I'm going to start with just a shot of the horse in question. Note that her hind end is much lighter than her shoulders. It's also somewhat straight across the top, from the croup to the tail. See how even as she stands still, her hind legs are "way out behind her." You can almost see her tilting forward. She is naturally very heavy on the forehand. At this time, with her level of fitness and so on, she drags the toes on both her forefeet and her hind feet as she walks around in the pasture. She's balanced all right; she's certainly not about to trip over herself and land on her nose. She's lifted her back to carry me. She's accepting "contact" well and she's controlled. But she's still strung out, and she is still primarily on the forehand. Her legs are "way out behind her," she's not tracking up, she's not lifting and extending her hind legs. Her hindquarter is straight much as when she is at rest in turnout. She's shortened her frame: She's lifted her head and arched her neck. She's tucked her hindquarter under herself. Now she's starting to work "on the bit." The main difference you can see if how she tightened up: instead of being strung out, she's shortened her whole body and her front end has been lightened.